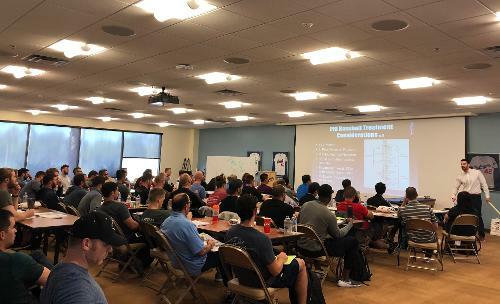 PRI Integration for Baseball (Glendale Arizona) - Camelback Ranch in Glendale Arizona was the site of this year's PRI Integration for Baseball course and it was a beautiful setting and a great course. Jimmy Southard, ATC was an excellent host. He took the extra time and energy to make sure everyone felt welcome and had everything they needed during both days of the course. I was grateful to have been able to co-teach this course again with Ben Hagar, PT, PRC. Ben is an excellent instructor that not only cares about getting it right, but makes sure questions are answered in such a way that course attendees get the most benefit from the discussion. We also appreciated having Kris Naig, PT, PRC with us to help out during lab as a lab assistant. Roughly 1/3 of the class were first timers at a PRI course and I loved having the interaction with such a fresh group. First and foremost, we respect and appreciate that so many new professionals were willing to invest their time and resources into learning about the science of Postural Restoration. The first half of the first day was completely devoted to properly introducing fundamental principles and concepts to this new audience so we were all on the same page as we moved forward into the performance component of the material. We discussed human respiratory asymmetry, the patterns associated with this asymmetrical respiratory drive and how these patterns relate to phases in the gait cycle. We further discussed appropriate ways to minimize these patterns so movement pathways become unrestricted for baseball performance. Then Ben moved the group into an interactive discussion around phases of early and late throwing mechanics, complete with a breakdown of slow motion video for each component of throwing. After bringing the group up to speed on the desired movement outcome for each phase of throwing, Ben was able to highlight compensatory movement tendencies for both right and left handed throwers because of the L AIC/R BC pattern. His mechanical breakdown of the throwing sequence was further expanded to include reciprocal movement assessment of the wrist, forearm, elbow and shoulder in three dimensions. These patterned considerations were also applied to early and late hitting mechanics to end the afternoon session on day 1. Day 2 was all about thoracic performance, objective testing and treatments for Superior T4 Syndrome, a common presentation in baseball. I started the morning discussion with right vs left sided considerations for the abdominal wall, lower trapezius and serratus anterior. I also went into the rotational considerations across the axial skeleton for a R BC athlete vs a Superior T4 Syndrome athlete and discussed limitations with rotation commonly seen both before and after addressing the L AIC/R BC pattern. Ben then took over and guided the group through lecture and lab for the 3 baseball specific performance tests used in this course. It was nice to go through the testing process together in each of the lab groups and to take the time to analyze the testing results and to begin to make treatment decisions. He then took the testing information into a discussion of treatment and focused on the baseball athlete with Superior T4 Syndrome. It was encouraging for the class to stay so focused on this particular category of rotational overhead athlete for a couple of reasons: First, because such a high percentage of baseball players develop Superior T4 Syndrome and second, because a full correction of Superior T4 Syndrome patterned and non-patterned rotational limitations corrects so many other things, for both right and left handed athletes. After learning and practicing these treatment techniques together in lab groups, Ben finished the second day outlining training considerations for both a right and left hander during stride to cocking and during acceleration to follow through. A welcome compliment to the detailed throwing analysis completed with all the slow motion video on day one. Overall, a great course with a great group of baseball professionals, that certainly helped all of us become better at what we seek to be good at.